Big announcement today! The high quality product Lanto Sinus, which contains the probiotic Lactobacillus sakei specifically for sinus support, is now available. This product contains an excellent strain of Lactobacillus sakei that is kimchi derived. Lactobacillus sakei is the one probiotic (beneficial bacteria) that has successfully treated the chronic sinusitis of many people, including all members of my family. It has been an amazing journey - and since using Lactobacillus sakei our sinuses feel great, and we have not had to use antibiotics in 6+ years! A win-win. More than 6 years ago I read research about the sinus microbiome (microbial community), and how chronic sinusitis sufferers lack the keystone bacteria Lactobacillus sakei that successfully treats sinusitis. There were no probiotics with L. sakei available back then. None. But we (my family) were able to successfully treat chronic sinusitis with live kimchi, which can contain Lactobacillus sakei (see Sinusitis Treatment Story). Kimchi is a wonderful product, but... with kimchi you never know if you're getting L. sakei, and even then it dies off rapidly. We went on to experiment with other products for years, with none of them ideal. So it is great that finally, after all these years, a product like Lanto Sinus is now available. Nice things about Lanto Sinus are that the Lactobacillus sakei strain is kimchi derived (an excellent strain! ), the product holds up well, it is in powder form, easy to use, and it only needs to be refrigerated. (That's right, it's meant to be refrigerated, and not frozen.) Since it also holds up well for a time without refrigeration, it also ships well. (After all, L. sakei lives and multiplies in our body at about 98.6 degrees Fahrenheit.) 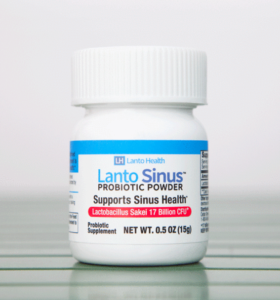 Lanto Sinus is sold by Lanto Health, and shipped from the NJ/NY metro area. Lanto Sinus is a high quality product that is produced with Good Manufacturing Practices, and is lab tested and verified. Gentle, yet strong. It is being sold as a probiotic dietary supplement. It comes in powder form with directions stating to mix with a little bottled water or take it dry, and swallow - after all, it is a dietary supplement. Lanto Sinus comes with a little spoon for ease of use. The product is meant to be used when needed for sinus support - that is, when there are some sinusitis symptoms. I want to mention that I have been a consultant to the company, and have been testing and using the product for over 2 years. As usual, I self-experimented various ways to see what works best for me - but of course, only using it when needed (for example, if I start to slide into sinusitis after a cold). After 6 years of self-experimentation in various ways my sinus microbiome has improved, so at this point I only need to use a little bit for successful results. What has worked for me is swishing a little of the dry powder in the mouth, and then swallow it, and not drink or eat for a least 30 minutes after that (to let it travel to the sinuses). Yes, I like the product a lot! By the way, the advice to use only when needed - should be applied to any probiotic supplement that is used as a sinusitis treatment or for sinus support. And as I describe in The One Probiotic That Treats Sinusitis - based on my family's experiences and many people contacting me - most people are helped by Lactobacillus sakei, but not all. Unfortunately there is no way to know if L. sakei will treat a person's sinusitis unless it is tried. This is because everyone's sinus microbiome (microbial community) is different - and so how one reacts to different probiotics can vary. By the way, L. sakei does not appear to treat allergies or allergy symptoms. [FEB. 2019 UPDATE: Lanto Sinus was originally called Lacto Sinus. On February 3, 2019 the company changed the name to Lanto Sinus in order to get a trademark. It is the exact same product - the only change is the name. This post has been updated to reflect the name change. And on a final note, some other news about L. sakei: According to several studies, when taken orally (swallowed) Lactobacillus sakei appears to be beneficial in certain skin conditions such as atopic eczema-dermatitis syndrome and atopic dermatitis. Another study found that patients with ischemic strokes had decreased numbers of Lactobacillus sakei in the gut (as compared to healthy individuals). It's an interesting microbe! Previous article:Drinking Baking Soda as a Medical Treatment? Is there any possibility this product would be available anywhere in Europe? Maybe in the future, but not at the current time. Update: The product is now available in many European countries. Wouldn't it be more effective to inhale it directly into your nose? Probably one would get a larger dose at once by smearing/dabbing a water & powder mixture in the nostrils, but.... it worked fine for me just swishing in the mouth. The other thing is that this is my 6th year since I started using a L. sakei product and I need less at this point. Thanks! I might try it directly in my nostrils so that it will be more obvious if it is effective. I have a hard time following through with things if I have doubts about the efficacy. I used the powder mixed with bottled water in the nostrils when I first tried it and it worked well. Started seeing improvement in a day or so. Then I tried the powder in the mouth later on and that worked also. I would say to try using it different ways. People typically have improvement in the first week, and some take about 2 weeks of intense use of L. sakei. As I've written in the post The One Probiotic That Treats Sinusitis - most people have positive effects from L. sakei, but there is a group (I think a minority) that it doesn't seem to have an effect. And you may fit into this group. Perhaps you would respond better to other products - such as kimchi (many species of bacteria), or a multistrain probiotic with other Lactobacillus and Bifidobacterium species (open capsule and pour powder on tongue, swish, swallow, don't eat or drink for about 1/2 hour to give the bacteria a chance to travel to sinuses - this is a gentle and safe way to try other beneficial bacteria species). In the meantime, it's OK swishing the L. sakei powder in the mouth and swallowing for more days - research shows it is beneficial for the gut and skin! Researchers agree that sinusitis sufferers have sinus microbial communities that are unbalanced or out of whack (dysbiosis) - but which microbial species will help treat the sinusitis may vary for some people. This research area is in its infancy so to see what works is a process of self-experimentation. thanks for the quick response! I have been eating kimchi (and occasionally putting that in my nostrils too), but I will try to do that every day. Is there a specific multistrain probiotic that you recommend? any thoughts on using a steroid spray (or Pulmicort in the NielMed saline rinse)? No specific brand - just look for an assortment of Lactobacillus and Bifidobacterium bacteria. I would look for a refrigerated product, and see if one helps you. And perhaps even try different brands with different assortments of microbes. Swishing in the mouth and swallowing is a gentle way to see if there are any positive or negative effects. The only bacteria that I would hesitate to try is Streptococcus salivarius K12 (also called BlisK12) - a number of people (myself included) with a history of sinusitis found it brings on sinusitis symptoms (just by swallowing the pills!). And I would not put any probiotic containing titanium dioxide in the nostrils (nanoparticles can travel where you don't want them to). By the way, even if a specific probiotic or bacteria (incl. L. sakei) doesn't seem to have any effect now - it may have beneficial effects when tried months later. It seems that our sinus microbial communities go through changes. I have not received feedback about putting a steroid spray in the saline rinse. But I do know people have sprayed steroid sprays into the nostrils on the same days (but not at the same time) as L. sakei treatments and also when using saline rinses - and that seems to be OK. The steroid sprays are anti-inflammatory and don't directly kill bacteria. Not at this time. I do know that the sausage starter culture B-2 (only L. sakei) is available though. I tried the product a few weeks ago and it works great! The sinusitis I've had for many years is finally gone. Thanks for all the information that you post. Thanks for the referral to Lacto Health. I am in California and my concern is the delivery time and temperature sensitivity since they are located in New Jersey. Overnight delivery costs from $37 to $51, depending on carrier. In your opinion how long can the bacteria outside before they start dying off? What is that maximum temperature? Have you done any studies on survivability at different shipment times? Lactobacillus sakei lives and multiplies in our bodies at 98.6 degrees Fahrenheit, so it can definitely handle warmth. And at ordinary room temperatures the product Lacto Sinus holds up well for over 3 weeks. I do know that the product has been lab tested and the quality verified after lengthy shipping with a variety of temperatures (cool, warm, and hot) and it was totally fine. According to scientific research, at 140 degrees F and higher all cells start to die. Thus, in extremely hot conditions overnight shipping is best. My personal opinion is that faster shipping is generally better for all refrigerated products. Hi Sima, have you looked into the possibility of inhalation of lacto sinus or kimchi? I’m assuming that lactobacillus Sakei or lacto sinus would not survive in boiling water? No Lactobacillus species will survive boiling water, so I don't know how one can inhale it deliberately (as a steam vapor), whether in a product or kimchi. Nasal sprays with probiotics are in the future. The current best alternative is to swish in the mouth, and then not drink or eat for a bit (to give the bacteria a chance to travel to the sinuses, throat, etc). I just received the Lacto Sinus yesterday. I put 1/8 tsp. in a paste in nostrils, and 1/8 tsp. by mouth last evening. This morning / today I am extremely groggy and my eyes are tearing. My symptoms seem worse. I have not done anything else differently (I used a steroid nasal spray maybe an hour before the Lacto Sinus.) Are you aware of others having such a reaction - especially the grogginess? Can this make you feel worse before better? Should I use less? Thank you for any feedback you can give me. Oh no. I have not heard of those symptoms. Several possibilities: the L. sakei for some reason died enroute during shipping. Or perhaps it did not mix well with another probiotic (e.g. BLIS K12 or Streptococcus salivarius) or supplement. Perhaps the steroid nasal spray. I also think that mixing a paste and putting it in the nostrils delivered an extremely high dose of the product. Normally mixing 1/8 teaspoon into 1/4 cup of water results in a liquid mixture that can be dabbed a little into the nostrils - once or twice perhaps (and one doesn't see any residue in the nostrils). The safest and most gentle way to test L. sakei is to just swish a little only in the mouth, and then not eat or drink for a bit. This is how I use the product. If you want to try again, wait at least a few days before trying it again, and then only swish a little bit (maybe 1/8 tsp) in the mouth. Not in the nostrils. A few people have reported taking a mega dose (not advised!) - and that it took a day or 2 to go back to normal. A main symptom is feeling that their mouth is very dry, and also their sinuses. But then usually the sinuses were improved after a day or 2. A person with acute sinusitis can find the same reactions as with antibiotics when using L. sakei: first day they stop getting worse, then they drain, and then it gets better. If you think it was a matter of "too much" of the L. sakei, then can try swishing in the mouth (one time) an ordinary multistrain probiotic with other Lactobacillus and perhaps Bifidobacterium species to see if that restores balance. This is all self-experimentation. Especially since every person's sinus microbial community (microbiome) is different. Perhaps L. sakei is not what your sinuses need. By the way, that strain of L. sakei has been tested in clinical trials and considered very safe. So that's good. Thank you so much for your response, Sima. I really appreciate it. I did use a lot of the paste, applying it a few times in my nostrils. I will certainly follow your advice. I am discouraged b/c I was really hoping that this was going to help. I've tended to have sinus headaches for years off and on, but have had more issues since August or so. My sense of taste is compromised; I have a bitter/salty taste in my mouth which seems to come from a post-nasal "drip," but don't have much noticeable mucous though my nose is a bit runny. When I took amoxicillin for a root canal I seemed to have a cold for about 2 weeks so likely my sinuses were draining, but the issue was not resolved. I tried a nasal irrigator but it seemed to increase the pressure in my sinuses somewhat and didn't help. Steam inhalation with a few drops of eucalyptus oil seems helpful. I finally went to the doctor and have been using the steroid spray for about 2 weeks, and taking an antihistamine (at night only) - this seems to have helped somewhat. I've been told, many many years ago, that I have allergies to dust and mould - I wonder if that might suggest a possible allergic reaction to this probiotic? In any case I will wait and perhaps try the approach you've suggested after a few days. Thanks again for your help! I'm wondering if your grogginess ever went away? I have Lanto Sinus and took it a couple times by swishing in my mouth but didn't notice much effect. I then tried the dab in nose then sniff method and now I feel like I have a bad head cold with stuffiness and I feel more tired and spaced out. I'm wondering if I over did it? Or maybe this is a good sign that it's fighting something? I've had chronic siniusitis for a while now and was hoping this would help. I'm wondering about what it means to use L Sakei "only when needed." If the idea is that our sinus biome is out of whack so that bacteria can easily multiply, and L Sakei helps to bring things back to balance, wouldn't we just want to use it just "every so often," just to restore and ensure balance? After all, people take other probiotics fairly regularly, eat probiotic yogurt every day, etc. In any case, I just started using L Sakei a week ago, after reading this blog and placing an order for Lacto Sinus. I had noticed signs that I was starting to get a sinus infection but hadn't gotten very sick yet. It does seem to possibly be helping. The early symptoms of a sinus infection have *not* turned into a full-blown infection this time, and that's usually what would have happened by now. So what would be the downside of taking L Sakei over a long time period? Thanks so much for the helpful information here, by the way. Sorry, I read more carefully and saw where you explained that overuse can make the sinuses feel dry and may cause light-headedness, etc. Thanks! Excellent questions - I've been thinking about this for years. I would say no to taking L. sakei if one feels good (no need for booster treatments), but yes if sliding into sinusitis. You used L. sakei in a good way - as needed when starting a cold and showing symptoms. And so it worked well. My sense is that one can avoid that problem by swishing it dry in the mouth, and only using when needed (starting some symptoms). Self-experimentation will answer when it works best for a person. By the way, clinical trials of L. sakei for eczema/dermatitis has shown it to be fine for several months when taken orally (the mouth). The sinuses feeling very dry applies to taking too large amounts at once - in one day. My 6 week old baby is constantly congested. Will this help him? I would not use it, or any other probiotic, with a young baby. All probiotics are strong. Please consult with your doctor regarding the baby's nasal congestion. L. sakei does not treat nasal congestion. The beneficial effects have been in adults with sinusitis symptoms. By the way, sinusitis in children typically presents as yellow or green mucus (snot) coming out of the nostrils, plus other symptoms. Nasal congestion may be an allergic response. One can try various things at home to see if it helps - for example, avoid perfumes, fragrances, scents, no air fresheners or essential oils, no dryer sheets, use unscented lotion, use unscented soaps. Can even try a good air filter. I mixed 75ml water with 10 mg of L Sakei and swabbed my nasal passage, is this mixture ok? Also mixed 150 ml water with 10mg and swished mouth and swallowed. Are these mixtures adequate? or should the ratios be increased? Sounds OK. Since using it in the nasal passages is self experimentation, you will have to decide for yourself what works or feels best. Just please be cautious.